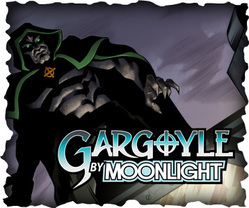 Gargoyle By Moonlight: Timothy Bach (writer); Brian Atkins (penciller); Miah Lambert (inker); Juan Romera (colorist). Click here to read the 7-page preview. Gargoyle By Moonlight, a 36-page mini graphic novel. Available on ComiXology. Also available through Gumroad. Figure out your destiny. Defeat a demigod. And do it all before sunrise. That’s the challenge facing Gary Doyle tonight. Afflicted by a curse that turns him into a stone gargoyle every night, Gary Doyle has been passing the time punching out creepy crawly underworld demons and trying to figure out how to undo the curse. When a raging demigod bent on annihilation begins rampaging through the city, Doyle, coached by the mysterious gypsy, Drina, and assisted by the equally enchanting archaeologist, Chloe Anders, must decide whether he’s a hero or the monster the world sees him as. Gargoyle By Moonlight is a monster-punching thrill ride! A standalone, complete story, this supernatural urban fantasy comic is fun old school storytelling with charming characters and stunning visuals. Full color; 36-page graphic novel: download a digital version ($1.99) from ComiXology or DriveThruComics or Gumroad; $4.99 for print, available now at Indy Planet. Want to check it out before you buy? We've got you covered. Read the first seven pages here. Timothy Bach (writer); Brian Atkins (penciller); Jeremiah Lambert (inker and letterer) Juan Romera (colorist). And don't forget about the Gargoyle By Moonlight Special Edition!